An otherwise relatively routine Huntington City Council meeting may take longer for public input --- on a decision to shut a mostly off the radar pedestrian tunnel at W. Fifth Street. Once volunteers painted and cleaned the tunnel under CSX railroad tracks, it's found new scrutiny and apparently more use. However, public safety has been raised ---- after all of the decrepit , defaced years --- for shutting the foot underpass down and, perhaps, filling in the relic from the late 30s when Owens Illinois operated on the other side of the tracks. Social media has batted the issue around and a conversation is planned at tonight's council meeting. Of all the suggestions, adding more lighting, a surveillance camera, and, perhaps, regulate the hours of use seems most reasonable. 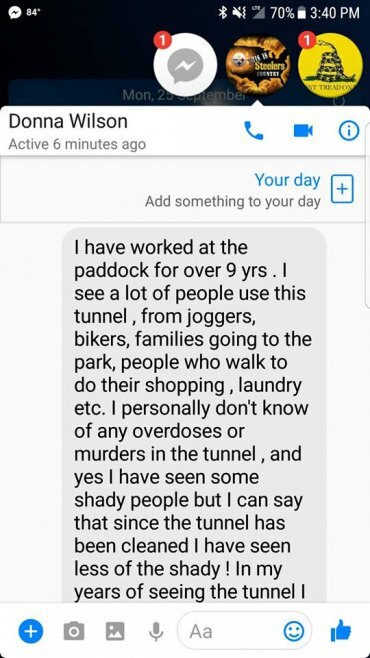 Donna Wilson, a longtime employee of the Padlock located on the southside of the pedestrian tunnel has stated she knows of no OD deaths or murders at the underground venue. "I have worked at the paddock for over 9 yrs . I see a lot of people use this tunnel, from joggers, bikers, families going to the park, people who walk to do their shopping , laundry etc. I personally don't know of any overdoses or murders in the tunnel . "Yes, I have seen some shady people, but I can say that since the tunnel has been cleaned I have seen less of the shady ! In my years of seeing the tunnel I saw the city clean it once that I know of and put new lights in it , but not pressure washed or painted like we the good citizens did , I work beside it and have for years. five days a week , and seen more good than bad ! And the cops have run a lot of the drug people away from here, after the cleanup many people have came to look and walk through it and take pics. "I've been informed that some children from HMS use that tunnel to walk to school. A child in that age group will risk crossing the tracks to get to school rather than walk further down. I will not side with the city on shutting this tunnel down. It's not worth risking a life trying to cross that track. Monitor the tunnel keep it clean; it's the cities job." " My parents have lived next to this tunnel for 35yrs. Never has there been an OD reported. My Dad has maintained the tunnel until last year when his health prevented him from doing so. My parents were at this meeting because they are worried that if this tunnel is closed (which my mom still uses to walk to work everyday and CSX tickets people for crossing the tracks) people will start to use in [my parents] backyard. "Instead of closing a functioning tunnel, how about the city stops cutting HPD officers and patrols it more often? If you think for a second that closing the tunnel is going to cut down drug use.. it's not. I can think of at least 10 other places in Huntington that should be closed due to drug use before the tunnel." "I live on the south side and have worried about my kids going to that tunnel to explore or ride their bikes as teenagers . I completely understand why Owens used it back in the day, but don't understand why it needs to remain open today. I appreciate the efforts of the people that cleaned it up, but you have to think about the safety of our kids and neighbors. Just because it is clean and painted doesn't make it any less sketchy. Huntington City Council meets Monday, Sept. 25 @ 7:30 p.m. in Council Chambers at City Hall.